42,000 m2 of clearing and grubbing of the embankments and stockpiles. 18,000 m2 of cutting and filling of batters. 30,000 m2 of final trimming to batters and flat areas. 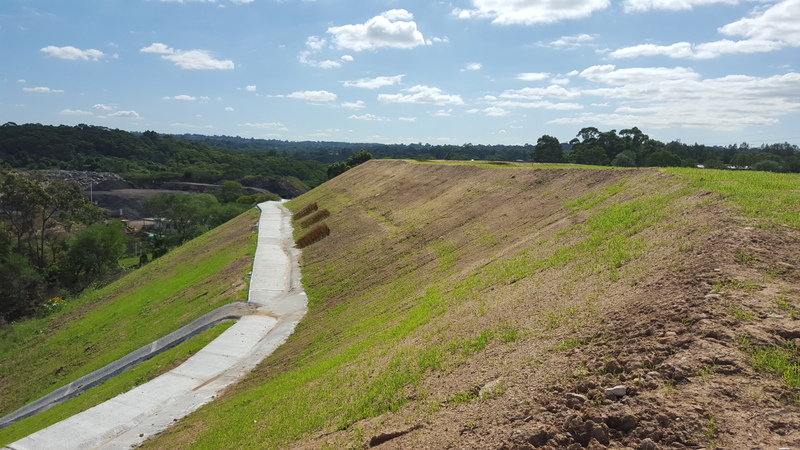 40,000 m2 of top soil re-used on site during landscape stage. 150 metres of shotcrete drainage including concrete support and the construction of swale drains utilising riprap rocks recycled from site. 120m of 1.8m footpaths throughout the site. 10,000 m2 of planting along the embankment areas. Cleaning and rehabilitation of the existing basin area including shotcreting of embankment and mid-berm.